Kubecon, Austin, Texas – 5th Dec: Canonical, in partnership with Rancher Labs today announce a turn-key application delivery platform built on Ubuntu, Kubernetes, and Rancher 2.0. The new Cloud Native Platform will make it easy for users to deploy, manage, and operate containers on Kubernetes through a single workflow management portal from dev-and-test to production environments. Users leverage a rich application catalog of docker containers and helm charts, streamlining deployments and increasing developer velocity. Built on Canonical’s distribution of Kubernetes and Rancher 2.0, the Cloud Native Platform will simplify enterprise usage of Kubernetes with seamless user management, access control and cluster administration. Rancher 2.0, which will be generally available early next year, includes everything you need to manage multiple Kubernetes clusters in production. The Rancher 2.0 user experience makes it easy to harness the full power of Kubernetes. Centralized management of user authentication, health checks and monitoring provides increased visibility and control. Users can stand up and manage new Kubernetes clusters using Canonical’s Kubernetes distribution or a cloud-hosted Kubernetes service such as Amazon EKS, Azure ACS or Google GKE. 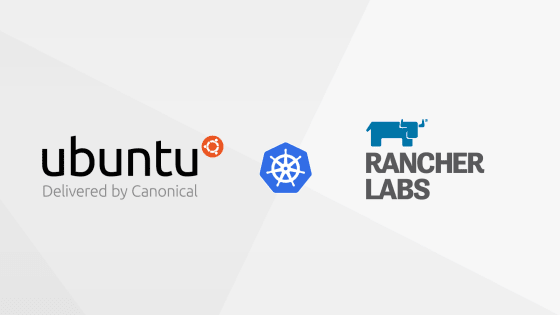 “Our partnership with Rancher provides end to end workflow automation for the enterprise development and operations team on Canonical’s distribution of Kubernetes” said Mark Shuttleworth, CEO of Canonical. “Ubuntu has long been the platform of choice for developers driving innovation with containers. Canonical’s Kubernetes offerings include consulting, integration and fully-managed Kubernetes services on-prem and on-cloud”. Canonical’s Ubuntu is the leading OS for cloud operations – public and private – and Canonical works with AWS, Azure, Google and Oracle to optimise Ubuntu guests for containers on those clouds. Canonical also works with Google GKE to enable hybrid operations between enterprise deployments of Kubernetes and the Google SAAS offering. Canonical is the company behind Ubuntu, the leading OS for container, cloud, scale-out and hyperscale computing. Canonical provides enterprise support and services for commercial users of Ubuntu.